After appropriate particle sizing and mixing to recipe, the bio-matter is loaded in to an Aergestor. While feasible to load via top hatches (left photo) it is better to fill Aergestors via a horizontal, telescoping conveyor through a hatch in their end door. A high speed flinger at the end of the conveyor lofts the matter and gives a full and level fill. Once a filled Aergestor has been taken to the composting site, it is demounted in to a vacant slot. The top and bottom aeration hoses, water hose and sensor cable are then connected in a matter of seconds. Valerie, the microprocessor of that composting station is quickly reset by keypad, which assigns a unique load ID and initiates Phase 1 of the composting regime that has been pre-set in the Valerie. Self heat to Phase 3 Santization at 70C for one hour or 60C for 2 days. Further Stabilsation B or a drying phase may follow to reduce weight in preparation for tipping and maturing. Aeration valves are especially designed so that Valerie can direct the cooling aeration flow upwards or downwards through the composting mixture to achieve homogeneity with minimal temperature stratification. 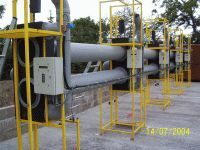 The Aerators' variable speed blower supplies cooling aeration to up to ten Aergestors and heat-exchangers extract the surplus heat for local use. If the recirculating 'air' gets too hot or its oxygen is depleted, then valves open automatically to ingest fresh air and expel spent air through the biofilter.